From Dec 09 / Jan 10 Newsletter. Yes that’s right (Spring), thought everyone could use something warm. Stamps used are from; Hello from Hero Arts. White Embossed Image from CTMH. 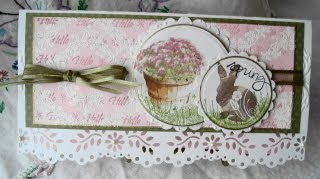 Basket and Bunny from Kitchen Sink Stamps. Spring is from Archiver’s Hot Spot. Punch is from Martha Stewart.